COMBINED WATER : 19% MIN. NATURAL GYPSUM MINERAL FROM THAILAND. OUR MINES SITUATED AT SURATTHANI PROVINCE, SOUTHERN OF THAILAND. IF YOU HAVE ANY FURTHER, PLEASE FEEL FREE CONTACT US. 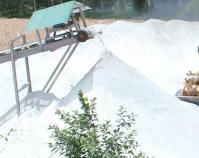 Our company is specialized exporter, manufacturer and supplier of NATURAL GYPSUM MINERAL in Thailand.